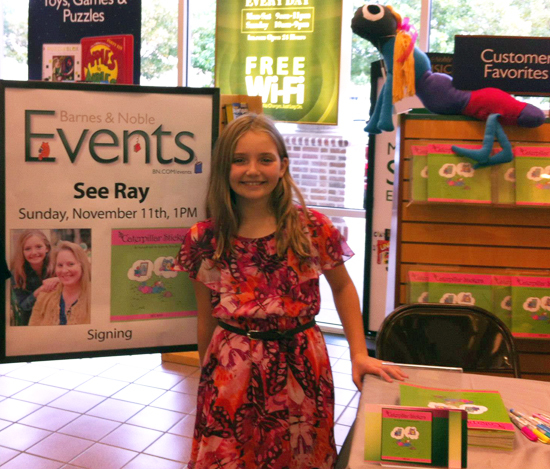 We recently introduced Sierra Rene Flad, a Fifth-Grader with Dyslexia who co-authored an inspirational children’s book, Caterpillar Stickers, with her mom, Ruth Flad. Caterpillar Stickers launched November 11 and inspires kids by sharing the message anything is possible! Below is Part One of the journey that led to discovering that Sierra has Dyslexia. Ruth Flad shares her family’s experience to help other parents facing the same situation. Dyslexia is not just about reading but it truly affects writing and spelling. Sierra sees everything in pictures. She says letters look like numbers. Phonics made no sense to her at all. Today she asks how to spell almost every word. We purchased an iPad for her to use the Dragon dictation and audio book functions, to give me a bit of time off. But she much prefers to write it out while we spell it aloud for her. There are many “side effects” along the pathway. Mostly it’s frustration which causes much anger and tears. Sometimes it’s not only her frustration. For the longest time she had problems with clothes. Sierra would not wear jeans until this year, 2012. Many materials and all tags bother her. I have learned just to cut the tags out if she says something, it saves on wardrobe changes! She has major hair sensitivity. “No brush shall touch syndrome”, is there such a syndrome? I had to keep her hair short until now as she screamed if you brushed her hair. Funny thing is she literally laughs uncontrollably from being tickled if a hair stylist runs the water-spout over her head. She’s a funny little girl. Another unfortunate side effect is her balance. My dear child falls a lot! On the soccer field almost every game, she would fall or trip herself. She is accident prone. I am always afraid when I receive a school call during the day. It’s usually the nurse and she’s never running a fever it’s always some odd ball accident. She fell off the monkey bars the 3rd day of 3rd grade, the nurse stopped calling me about some things like scratches and cuts…. Every now and then, I get a call to warn me of her appearance. The last one I remember had to do with her hand being smashed by a ping-pong paddle, on the ground, and she was nowhere near the table…how does that happen? We were at a Girl Scout, mom and me camp, with her troop and the girls blew their whistle, screaming for help. Immediately I jumped up and thought ‘oh my what now?’ In the distance, we saw her friend bent over and someone said she was getting sick so her mom ran out to help. The next thing I knew the friend’s mom was carrying Sierra on her back! Sierra had those brown burr type thorns in her feet. I saw a few and started to pick one out of her heal and then a couple from her toe. Then I moved all the way around her where I could see her entire foot, I nearly fainted. Her foot was brown with burrs. I had to try to keep composed so she did not realize how bad it was, but I was freaking out. Both of her feet were covered with thorns. How does someone walk both feet into a rug of thorns? My angel girl did. Thank God for her friend’s mom as she is a practitioner and picked every last one of those thorns out of her feet. Sierra was very brave, I was not. There are dozens more stories and probably some I could not think of like the elevator incident… but we’ll leave that for another time. Recently we were looking at some Facebook postings and there was a page script of smashed letters and numbers mixed together, but if you looked carefully your brain would help you read it. Sierra was able to read it quicker and better than her brother who is 4 years older. She said this is how all writing looks to me. She was excited to give us some insight to her vision. Sierra has found love in performing arts. She sings and acts at the Plano Children’s Theatre and has improved in so many areas. Her success on stage gives her confidence and carries over a little into her daily classroom subjects. Caterpillar Stickers – Anything is Possible! I constantly remind Sierra that she can do and be anything she wants to be. Often when she or her brother, say “but I can’t”, I reply with “When you think “I can’t” then drop the “t” and you “Can”. Now they finish my sentence….”I know, I know, you can change “Can’t to Can” by dropping the “t’. Our book was something we did together. We have always shared our imaginations, telling and making up stories. This book Caterpillar Stickers found a place in our hearts and we wrote it down and wanted to publish it and share it with the whole world. We want people to look inside themselves and see their inner beauty. We want to inspire others not to give up. Encourage the young, especially, to see that glitter and wings only change what people see on the outside. Perseverance and doing the right thing is what transforms us, making us beautiful from inside out. We stress always finishing what you start to both our children and strive to lead by example and hold their hand if necessary. We are very pleased with our book and hope others will enjoy hearing and reading it too. It has been a great learning experience for all of us. We are so thankful that ADA is listed on the back cover of our book and hope this reference will help others in need.